Seeing that it's Labor Day Weekend - my challenge to the players today was to create either a Baby or a Patriotic card...I choose to create both. 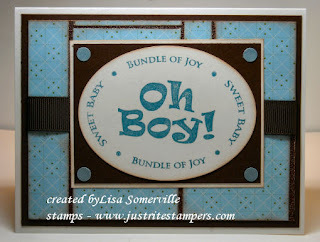 My first card is a Baby card and features the Designer Tiles Technique from the TJNL - although I only used 1 DSP, as it was the only baby colors I could find! It also uses the JustRite Baby Stamp Ensemble. I don't actually own that stamp YET, I just happened to have an image stamped from when I visited the JustRite booth at CHA. 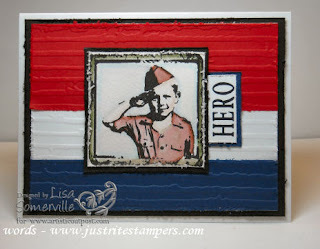 My patriotic card uses the Hero Plate from Artistic Outpost for the main image, and because I misplaced my "hero" sentiment from that plate - my JustRite Stampers Monogram came to the rescue! My image on this card is done with the Marker Watercolor Technique (TJNL). For my background, I adhered my card stock to a panel piece then ran it through my cuttlebug folder and distressed the edges. If you'd like to play along with this weeks challenge, just leave a link to your card here on this blog post, or if you upload to SCS, use keyword BC62. Have a safe and relaxing Labor Day Weekend! Lisa these are both fantastic. I love the sketch in the baby card and the proud boy is gorgeous. I really love the baby one. I may someday brake down and buy a JustRight stamper. Your designs have been wonderful. WOW...two cards, I'm so impressed! Both are fabulous, as always! Love the distressed tiles on the baby card, and the image on the patriotic one is SUPER! Great job! BOTH cards are wonderful!! LOVE them BOTH!! And MaryJo is right....you just may have tempted many of us to purchase a Just Right stamper.....I know you've converted me!! WOW! These are both FABULOUS! TFS! LOVE both cards! Oh, I think you just put me over the edge on getting that Stamper...some funds in Paypal just burning a hole in my bank account. Great job, Lisa. As always, both are super! I love the patriotic one best though. That image is just wonderful! Love both the cards you made. The patriotic card is wonderful, I just got that cuttlebug background! Love 'em both, but the patriotic one is my favorite!!! Great job!! These are both great! I can't decide which I like better! Great job! Both are truly stupendous! I particularly like the patriotic one. hahahaha...everytime you post a card with that little boy saluting I think I love it! Both cards are wonderful! You are the Just-Rite Queen as far as I'm concerned! That saluting boy is always a winner! Both cards are fantastic, Lisa. I think the little soldier is just adorable though. Excellent job incorporating JustRite stamps! You have my vote!!!! Both cards are beautiful...but that Hero card is something amazing! OK, you over-achiever you! :-) Both of these cards are terrific Lisa! Looks like we're both fans of Artistic Outpost. great job on both accounts!! Super job, Lisa! Love that flag! These are both great, Lisa! I really like the background on the patriotic card--the distressed stripes are a perfect match for the image, especially in red, white, and blue. Great cards! I especially love the patriotic one, but then again, I love all of your cards! Love the layouts on both cards Lisa! Great cards! I love the embossed background on your patriotic card. You did a wonderful job with this challenge.